Veteran soul singer Jaya welcomed the reunion of her fellow singers and hosts of now-defunct variety show “SOP” following Regine Velasquez’s transfer to ABS-CBN. Queen of Soul Jaya, Singer-Songwriter Ogie Alcasid (Fanpage), King of Soul Janno Gibbs, Asia’s Nightingale Lani Misalucha and Asia's Songbird Regine Velasquez are now a "Certified Kapamilya". She also shared a throwback photo of them stamped on Aug. 11, 2016. In the caption, she expressed her gratitude for having met them in her singing career. “I miss singing and goofing around with them and I am so blessed and honored to have shared the stage with them. I have only much love and respect for these guys and gals and I am soooo wishing that we can one day get together and just talk about the good old days and maybe even sing together,” Jaya said. 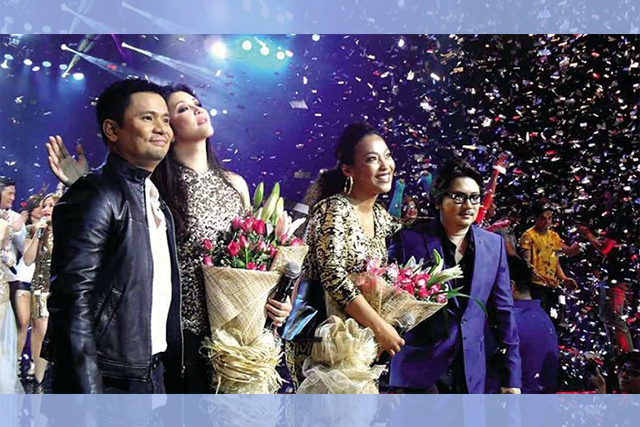 The four Filipino award-winning artists were the original hosts of GMA’s “SOP” or “Sobrang Okey, Pare!” before the show ended. Velasquez was the last of them to transfer from the Kapuso network, finally reuniting with former colleagues. In 1997, GMA launched the “Sobrang Okay, Pare!” to compete with ASAP for a noontime variety every Sunday. The first hosts and main performers for the TV program were Velasquez, Jaya, Misalucha and Gibbs. It successfully ran for 13 years before it was replaced in 2010. The group continued to perform with the new “Party Pilipinas” until it was eventually cancelled in 2013. That year, Alcasid made a decision to move to then rising competing network TV5 until his contract expired in 2016. It was also in 2016 when Jaya switched to ABS-CBN after her teleserye with GMA ended. Gibbs, meanwhile, signed a contract as a recording artist with Star Music, a recording company owned by ABS-CBN, last September. Velasquez tells reporters that her reason for leaving GMA, which she had worked with for nearly 20 years, was her desire to work with other people. “I just wanted to work with other people… and they are all here” she said. Her husband, Alcasid should not be blamed for her sudden move. “They were all blaming him. It’s not really fair… Hindi sa kanya nanggaling ang idea but it came from me,” Velasquez said. She revealed that it was Alcasid, who became a Kapamilya in 2013, who made the initiative to set up a meeting with the management. Velasquez admitted that she was hesitant at first if the management would still be “interested” in having her. Her career in entertainment kicked off with ABS, but then transferred to GMA in the 1990’s and stayed there for many years. “I was so happy when they said, ‘Of course, we are interested (in you).’ I’m really happy to be here,” Velasquez shared. Her first and only acting award came from a role she played in “Maalala Mo Kaya,” a weekly drama series of ABS-CBN, in 2002. Prior to this, she also revealed that she had starred in lesser known programs when she was still 16 or 17 years old. The singers whom she had helped back then, Sarah Geronimo and Rachelle Ann Go, were also talents of ABS-CBN.